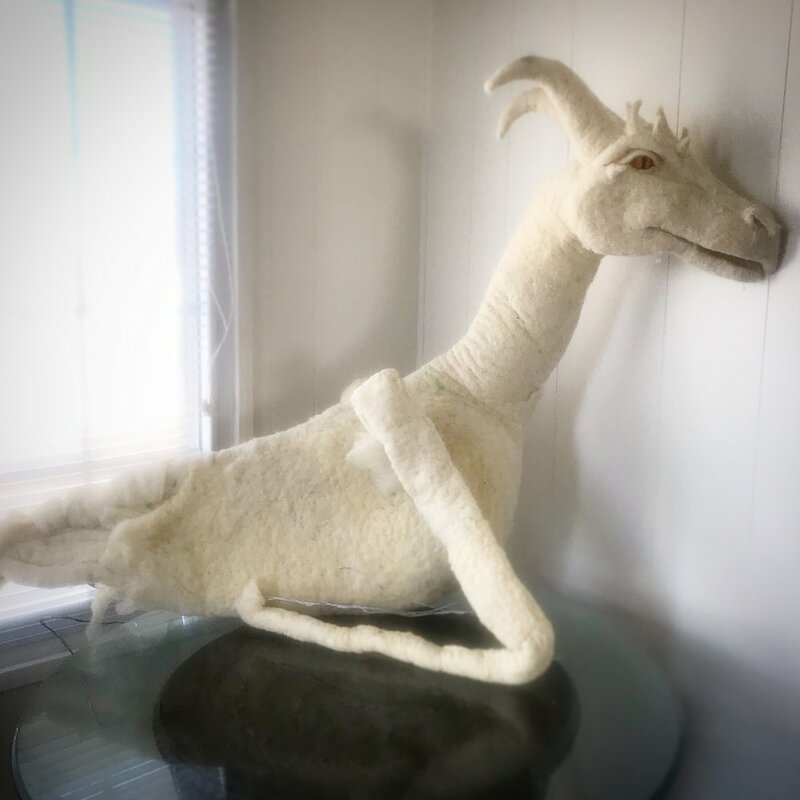 Known to most who follow her on Instagram as knottietawnie, Tawnie is a fiber artist extraordinaire who works on a larger scale than most felt artisans. 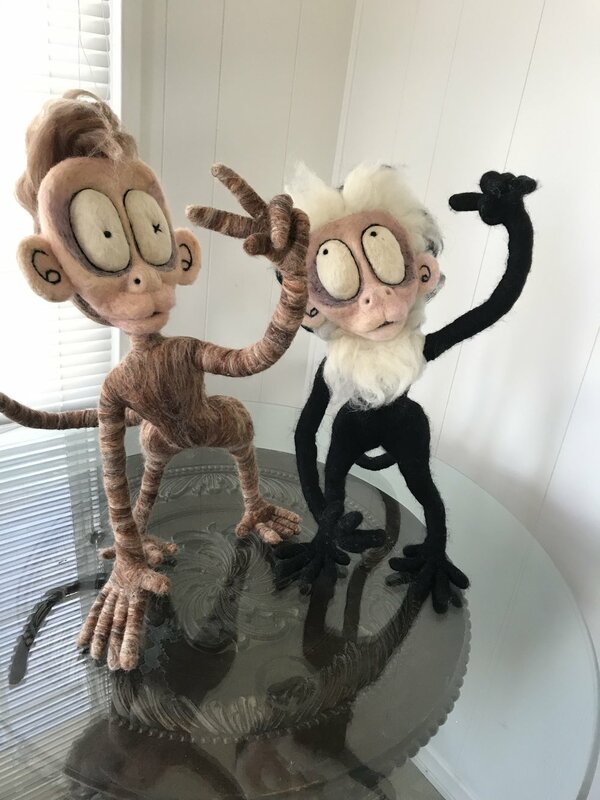 She has been needle felting since the fall of 2015 and competed 2015-2017 in fair and won best in show 1st, 2nd and 3rd in the LA and San Bernardino county fairs. Tawnie dabbles in felted paintings, toys and wool art toys. Tawnie enjoys creating pieces that make people stop and smile. We have donated to her art by giving her large bags of our 275g and 500g wool. She turns them into the most incredible critters by felting them to a wire form she makes herself. Tawnie calls herself a So Cal crochet and needle felting artisan, we call her fabulous. This is a pair Tawnie recently felted. “Grasp” on the right is modeled after a Capuchin monkey! Better known as “Ice Cream the Unicorn”. 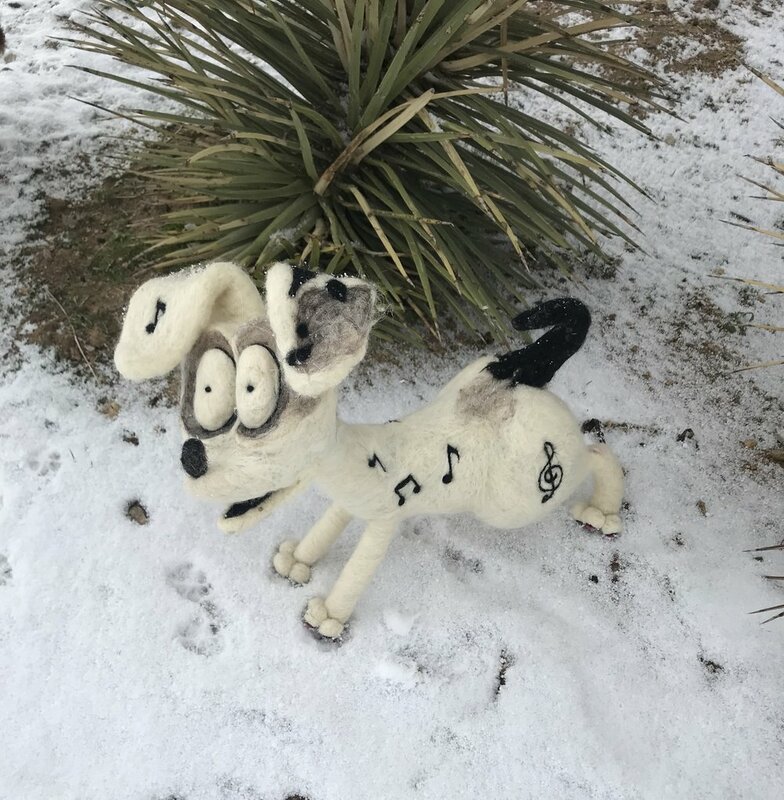 Meet “Treble” who seems to like the recent snowfall in Southern California. This is “Fable”, after completion, he will be a whooping 10 feet long and approximately 4/5 foot in height. Find Tawnie at the Rose Bowl Flea Market, Melrose Trade Post, Torrance Sreet Faire or Instagram direct message @knottietawnie. Bill divides his time between his art and being the Executive Director at the Coachella Valley Art Center. His latest piece is done for a Veterans exhibit at the Marks Gallery, College of the Desert, Palm Desert. The installation is his interpretation of the 1968 TET Offensive's Battle of Hue, Viet Nam. The event was his introduction to Viet Nam and War. Bill used Berkeley Ergonomics wool to represent the 216 American boys killed during the month long battle. 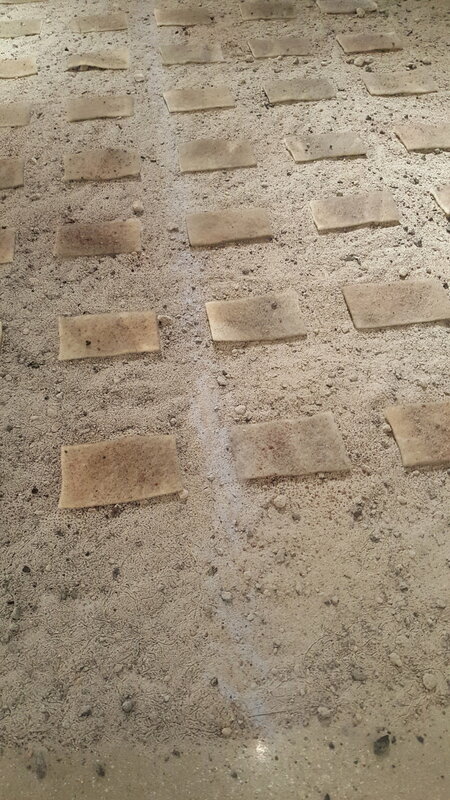 They "float" on a bed of dirt and charcoal bits. “… is a fiber artist and photographer who uses vibrant color as her main medium. 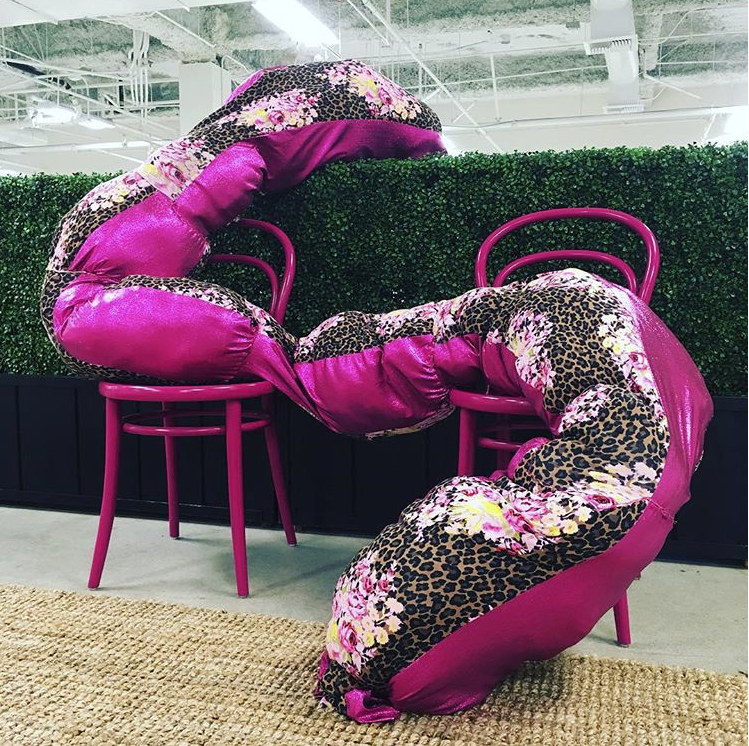 She can often be seen around town creating temporary colorful soft sculptures that respond to the architecture and environments of Los Angeles. 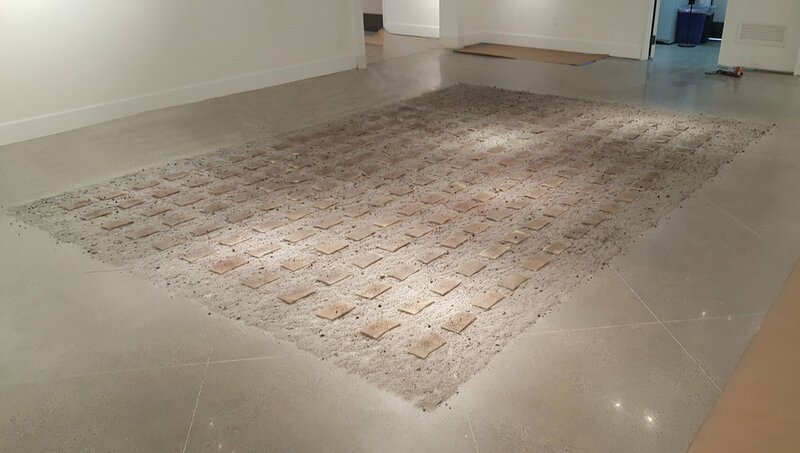 She is a certified Chopra Center meditation teacher and recently received her MFA in Fiber Art from CSULB. Mimi teaches at FIDM and The Craft and Folk Art Museum”. Mimi has used Berkeley Ergonomics wool as part of her medium in these fine art pieces. The small piece with the glass dome is called "specimen" and the larger piece is untitled as it's a study for doing something larger scale. This recent work (made with recycled fibers of wool panel remnants from Berkeley Ergonomics) uses the nerve cell as a starting point to explore ideas of connection, and suggests parallels between our inner biology and the external morphology of the plant kingdom. The Muck is a cultural center housed in a historic 1920's mansion in the heart of Fullerton. The center hosts exhibitions, performances and educational programs. We recently donated some of our material remnants (coils, latex and fabric) to this amazing organization and are proud to support their engaging educational programs to Orange County’s diverse communities and beyond. These slippers were made by young students currently in homeless shelters and refugee centers. With a little bit of imagination and creativity, they transformed the foam from our mattresses into cozy house slippers! The Muck says "We are a celebration of the human spirit through the arts" and we are so happy to be a small part of this. At the Muckenthaler Multi-Arts Summer Camp, Lead Artist Marsha Judd inspired students to use their imaginations as they created whimsical wire sculptures with our coils! Wendy La Croix is a mixed media artist in Southern California. She has used the Berkeley Ergonomics mattress pillow top wool to stuff the fabric piece then added stick pins to it. Wendy calls her piece "Kisses: 5 Cents" and it’s meant to hold little notes or memorabilia ...or whatever suits your fancy!